Seconds after the nine-pound musket is raised to Anthony Riccio’s shoulder onlookers are momentarily riveted by a brilliant flash, billowing smoke and a resounding blast. As the scent of gunpowder clears, a connection with the past is made; the sense of living history is complete. 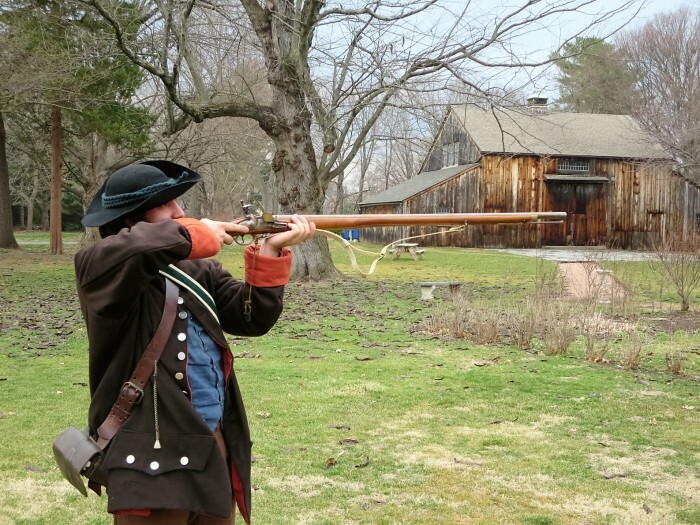 Riccio’s 18th-century musket demonstration serves as the finale of the new “Revolutionary Soldier” Digging Deeper Tour at the Webb-Deane-Stevens (WDS) Museum. Offering an in-depth view of the life of a typical Continental soldier, upcoming tour dates for “A Soldier’s Life” November 12, at 10:30 a.m., and 1:30 p.m. Admission is $15 per person. Space is limited and advance-ticket purchase is recommended. For tickets visit: http://webb-deane-stevens.org/tour-tickets. On the second Saturday of each month, a Digging Deeper Tour will offer the public an interactive, behind-the-scenes examination of specific aspects of the lives of the former residents of the three homes that comprise the Webb-Deane-Stevens Museum. A Digging Deeper Tour featuring items from the museum’s extensive textile collection is currently in development and slated to debut this summer. 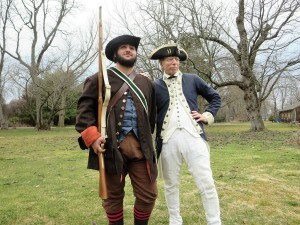 The “Revolutionary Soldier” Digging Deeper Tour features the expertise of veteran reenactor and WDS guide, Sal Carmosino, who will be assisted by Riccio. 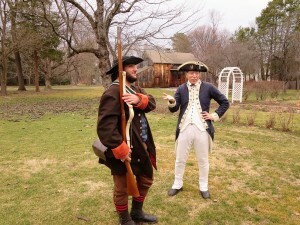 Dressed in colonial garb, the two Revolutionary War enthusiasts will take the public on a journey through life of a colonial “regular,” examining the contents of a typical soldier’s haversack and demonstrating now-outdated items such as a wooden canteen, a gunpowder horn made from a cow’s horn, sealing wax, quill pen, dice made from musket-balls, a fire-starting kit with flint, and even a mouth harp. Visitors will view the dress sword worn by Webb House resident Sam Webb during the inauguration of George Washington, and see an exact replica of Washington’s uniform. Carmosino will explain the significance of the Continental soldier’s uniform colors, and explore Washington’s goals for creating a viable army to defend the colonies. The tour will also show in detail why General Washington stayed at the Webb House for five nights in 1781, and how the final battle of the Revolutionary War was won. Designed to satisfy even the most curious, the tours allow ample time for questions throughout the tour. Carmosino has been an avid Revolutionary War reenactor for decades, including 37 years with the 5th Connecticut Regiment, with which he has participated in events at Valley Forge, Saratoga, Yorktown, West Point, and the annual Webb-Deane-Stevens Museum Revolutionary War Encampment. He was previously involved in minuteman groups in the Boston area during the bicentennial years of 1970-1976, and he has also been a Civil War reenactor for more than three decades. He has appeared as a Continental officer in three episodes of the PBS “American Experience” series, including a segment on John and Abigail Adams. For 16 years he has been a guide at the Webb-Deane-Stevens Museum, where he also serves as a curator technician, which involves the care of the collection. A fan of colonial history from a young age, Riccio has been with the Hale Homestead since 2009, first as a volunteer with a junior-docent group, then as a tour guide/educator. Donning a red coat in 2012, he joined the 54th Regiment of Foot, a reenacting infantry regiment of the British Army. 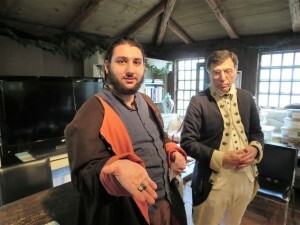 As a reenactor he has traveled up and down the eastern seaboard recreating the battles of the revolution. He is currently a student at Tunxis Community College. Located in the heart of Connecticut’s largest historic district, the Webb-Deane-Stevens Museum consists of three authentically restored 18th-century homes and provides the quintessential New England experience – from the American Revolution to the early 20th century. Tours include the 1752 Joseph Webb House, where General George Washington met with French General Rochambeau, and planned the military campaign leading to the end of the Revolutionary War, the 1770 Silas Deane House, built for America’s first diplomat to France, and the 1788 Isaac Stevens House – depicting life in the 18th and 19th centuries through original family objects and a fascinating children’s exhibit. For rates and hours visit www.webb-deane-stevens.org or call (860) 529-0612, ext. 12.